Ideal for an Omega necklace, nice chain, or enjoy as a lapel pin and pendant combo. Just check out the detail in this fine harness Saddlebred design. Complete with buggy and female rider and to give it The Gorgeous Horse touch. We made it in full three offering actual revolving wheels on both sides of the buggy. 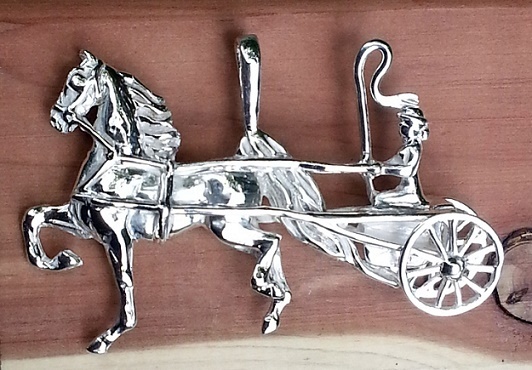 Impress the driving rider with this pendant today! Try this piece satin finished to show maximum detail in the harness and rider.